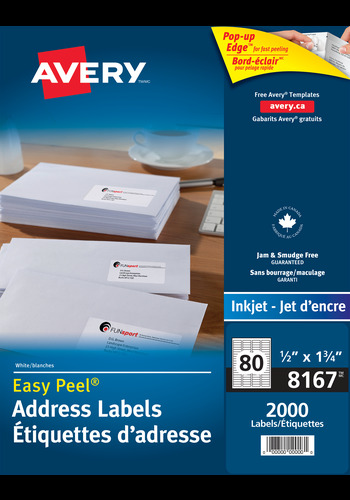 with Easy Peel® for Inkjet Printers, ½" x 1¾"
Complete high-volume mailing projects easily and save time with Avery® Easy Peel® Address Labels. These bright white permanent labels will deliver superb print quality with sharp text and clear graphics. Create multiple labels in minutes using mail merge to import data from Excel®, Outlook® and more. Complete high-volume mailing projects easily and save time with Avery® Easy Peel® Address Labels. These bright white permanent labels will deliver superb print quality with sharp text and clear graphics. Easily design professional labels using the easy and free Avery® Design & Print Online Software. Create multiple labels in minutes using mail merge to import data from Excel®, Outlook® and more. You'll get letters and mailers out the door with Easy Peel® label sheets. Print label sheets from your printer, then easily and quickly peel labels with the Pop-Up Edge™ feature and complete your work in no time. Just bend label sheets in half to expose the label edge, peel and apply to quickly label envelopes. Jam-free and Smudge-free Guaranteed to ensure perfect labels every time! The permanent adhesive ensures these versatile little labels stay put on envelopes, postcards, care parcels, books and more. Save time and create professional address labels to help expedite all your important letters. Label Size ½" x 1¾"
Jam and Smudge Free Guaranteed! Avery templates and mail merge make high-volume projects a breeze for unique labels for special occasions, marketing mailers, invitations, thank you cards, party favours and more. Create easy-to-read labels for boxes to identify goods, storage and easy identification, warning labels, property and more. Add monograms, logos, images, or designs for a creative and professional finish on creative gift boxes, sticker projects, festive holiday tags, scrapbooks, and more.